If there is corn syrup, high fructose corn syrup, corn sweetener, dextrose, glucose, cornstarch, modified cornstarch, vegetable starch, corn solids, or corn oil – choose organic. It means skipping most sodas and many baked goods. 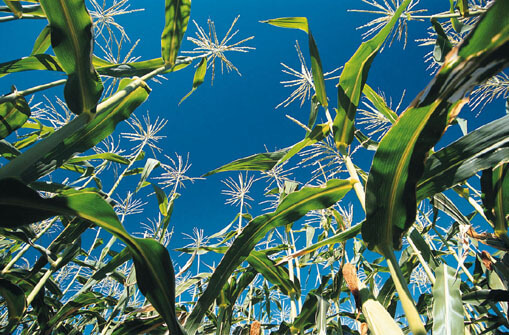 More than 4000 US products contain corn as an ingredient67. And this doesn’t count all the corn used in livestock production. To select organic corn means selecting organic meat, poultry and dairy. The industrial production of conventional corn has a devastating impact on the American landscape: our soil, our air, our livestock, and our waters. Switching from conventional to organic corn is extremely difficult, but it could do wonders for the health of your family. And no other change would improve the health of so many acres of cropland. 61USDA Economic Research Service. Corn Briefing Room, April 20, 2006.http://www.ers.usda.gov/Briefing/Corn/ accessed Feb 5, 2007. 62USDA Economic Research Service. Soybeans and Oil Crops Briefing Room, http://www.ers.usda.gov/Briefing/SoybeansOilcrops accessed Feb 5, 2007. (says soy ranked #2, only behind corn). 63Total US 2005 US fertilizer use was 22,146,200 tons, or 44.3 billion pounds. (USDA. U.S. consumption of nitrogen, phosphate, and potash for 1960-2005. http://www.ers.usda.gov/Data/FertilizerUse/Tables/Table1.xls accessed Feb 5, 2007). Fernandez-Cornejo, J. “Adoption of Genetically Engineered Crops in theU.S.” Data product. U.S. Department of Agriculture, Economic ResearchService. http://www.ers.usda.gov/Data/BiotechCrops. accessed July 2005. Fernandez-Cornejo J and Caswell M. The First Decade of Genetically Engineered Crops in the United States. USDA Economic Information Bulletin Number 11. April 2006. 65Certified organic and total U.S. acreage, selected crops and livestock, 1995-2005. USDA. December 15, 2006. 66Dandelski JR. Marine Dead Zones: Understanding the Problem. Congressional Research Service. Report for Congress 1998. Hypoxia, the Gulf of Mexico’s Summertime Foe. Watermark. Sep 2004 (26)3-5. Berman JR, Arrigo KR, Matson PA. Agricultural runoff fuels large phytoplankton blooms in vulnerable areas of the ocean. Nature. (2005) 434:211-214.